Gotta love this Monkey Island renaissance. Not only does it get us new Monkey Island games, it gets us new Monkey Island merch. And nice merch to boot! This $90 statue will be available from Lucas' own StarWarsShop come September, and stands 10" tall. 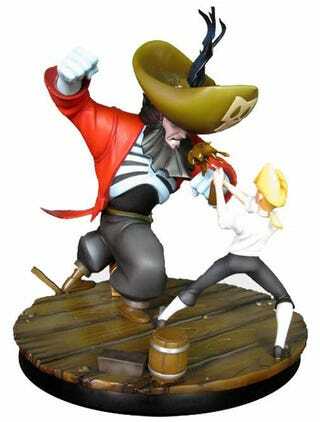 Depicting a very human LeChuck against a very weedy Guybrush Threepwood (who is captured mid-root beer salvo), there will only be 1000 made available. Well, 995 after I'm done with them.